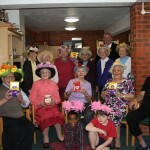 Lodge Brothers of Brentford provided Easter Eggs to the residents at Jessops House as part of their Easter Celebrations. Jessops House Scheme Manager, Margaret Ayers MBE said ‘I would like to thank Paul Bye and Valerie Perkins for arranging this – the residents loved it, the residents even made Easter bonnets to help celebrate Easter’. Two pupils of Kew Green Preparatory School acted as Easter Bunnies and gave the eggs out to residents the students were chaperoned by Natasha Bradshaw the Superintendent of Mortlake Crematorium and Lodge Brothers provided a limousine to transport these VIPs around.